Painted Watercolor Note Cards with Envelopes (Box of 10) All Occasion Blank Greeting Cards Cute Animal Thank You Notecard, Appreciation 'Rainbow Wildlife' Stationery (4'' x 5'') M4948OCB-B1x10 est le grand livre que vous voulez. Ce beau livre est créé par . En fait, le livre a pages. The Painted Watercolor Note Cards with Envelopes (Box of 10) All Occasion Blank Greeting Cards Cute Animal Thank You Notecard, Appreciation 'Rainbow Wildlife' Stationery (4'' x 5'') M4948OCB-B1x10 est libéré par la fabrication de NobleWorks. 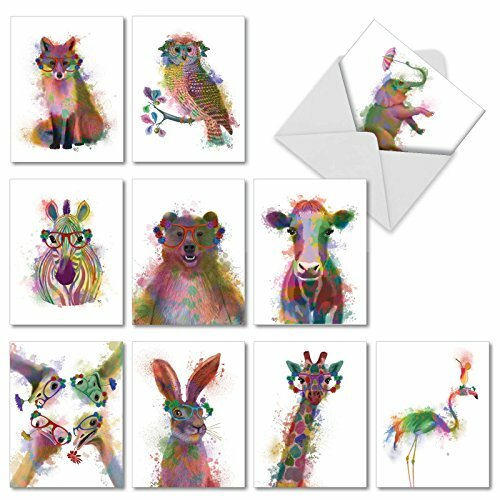 Vous pouvez consulter en ligne avec Painted Watercolor Note Cards with Envelopes (Box of 10) All Occasion Blank Greeting Cards Cute Animal Thank You Notecard, Appreciation 'Rainbow Wildlife' Stationery (4'' x 5'') M4948OCB-B1x10 étape facile. Toutefois, si vous désirez garder pour ordinateur portable, vous pouvez Painted Watercolor Note Cards with Envelopes (Box of 10) All Occasion Blank Greeting Cards Cute Animal Thank You Notecard, Appreciation 'Rainbow Wildlife' Stationery (4'' x 5'') M4948OCB-B1x10 sauver maintenant. With thousands of happy customers every month, this premium set of watercolor painted cards provide the perfect sentiment. With plenty of writing space for holidays, congratulations, well wishes, and more...these colorful cards merge the highest design & quality with beautiful pictures of ten animals. Animals include: bears, owls, peacocks, rabbits, and more! This set of 10 greeting cards were originally published in an assorted stationery note set as part of NobleWorks' non-humor brand, The Best Card Company. Funky Rainbow Wildlife is part of a larger collection that spans a broad range of motifs, from traditional themes to contemporary graphics to vintage art - definitely something for everyone! This card is printed on-demand in the USA on thick, bright, premium recycled paper. Many of the designs are available in both greeted and blank versions. NobleWorks is a relatively small, US based, family owned company and has been publishing stationery products since 1980. Originally based in New York, NobleWorks now operates in New Jersey. We love what we do, and we publish our own original content in most cases combined with licensed contributions from a wonderfully creative community of artists, writers, illustrators and cartoonists; some have been collaborating with us for more than 30 years. Known for our funny cards and what has been described at times as snarky humor, most our revenue comes from our design based note cards and stationery products. We proudly print all our products in North America, mostly in NJ (of all places)! Every card is printed to order and on demand, which eliminates waste & obsolete inventory. No matter what the product is, we strive for 100% perfection and customer satisfaction - every card, every order, every time. We are here to serve whether you purchased our stationery directly from us or from authorized resellers. #1 SELLING BLANK NOTE CARDS - These 4'' x 5 ¼'' beautiful, animal cards are perfect for any occasion and feature an assortment of wildlife. Bright and professionally painted colors show a fox, bear, zebra, giraffe, elephant, and more. Each professional greeting card with envelope is shipped in a reusable box for your convenience. ☛ BEAUTIFUL WATERCOLOR PAINTED DESIGNS: You'll instantly love the creativity, time and care that was put into each color painting. Kids, Friends, family, and loved ones will adore this assortment of ten, small 4'' x 5 ¼'' animal themed greetings, with 10 envelopes. Designs are blank for you to personalize. We offer a wide selection of designs and art styles, offering a unique match for men and women looking for the right notecard for their special, personal message. ☛ FOR ALL OCCASIONS: Perfect, high quality stationery for writing thank you notes, happy birthday, or wedding & engagement wishes. All gift cards ship with an envelope & arrive in a reusable box for your convenience. They store easily in a home office, desk, or at a business. A variety of stationary art and designs in our note card sets look great framed! Try framing them individually, or grouping several in a collage frame, to create visually appealing wall decor. ☛ MADE IN AMERICA - Keeping US jobs at home, our most of our products are proudly made in North America for more than 35 years, unlike our off-brand Chinese competitors! We print our small 4x5, greeting notecards on snow white, thick, recycled cardstock, made from renewable farmed trees. Our Print on Demand technology is eco friendly, reduces waste and minimizes environmental impact. ☛ ABOUT US - Founded in 1980, NobleWorks - and The Best Card Company, its non-humor division - is an award winning brand and an American based, family owned stationary publisher. A proud board member of the Greeting Card Association, we strive for 100% perfection and customer satisfaction - every paper card, every order, every time. We are here to serve whether you purchased our bulk stationery directly from us or from authorized resellers.